Germany, France, Denmark and Norway bid for the 2017 Senior World Championships. 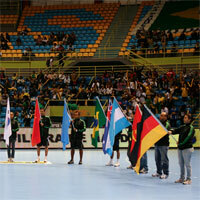 The Council of the International Handball Federation IHF (including EHF President Tor Lian and EHF Vice President Jean Brihault) will award the Men’s and Women’s World Championships at their next meeting on the fringes of the World Championship in Brazil on 15 December in Sao Paulo. The bidding nations will present their bids to the members of the IHF Council, who will make their decision on the same day. Germany is the only bidding nation for the 2017 Women’s World Championship. Germany was the host of the Women’s World Championships in 1965 and 1997 and of the Men’s World Championships in 1958 (GDR), 1961 (FRG), 1974 (GDR), 1982 (FRG) and 2007. Germany hosted the first ever Women’s EHF EURO in 1994. France and Denmark submitted their bids to the IHF by the deadline, whilst the Norwegian bid arrived at the IHF Head Office after the fixed deadline. In one of the first topics of their meeting, the IHF Council will decide on whether the Norwegian bid will be taken into consideration. Denmark was the co-host of the 1999 Women’s World Championship and host of the 1978 Men’s World Championship. Denmark has also hosted the Women’s EHF EURO twice and was awarded with the Men’s EHF EURO 2014. France hosted the Men’s World Championships in 1970 and 2001 and was host of the 2007 Women’s World Championship. With one exception all the senior World Championships until 2017 will be staged in Europe.